Overview: Understanding the mechanism of psychological projection can help you realize your potential. Here’s how. Think about someone you admire, perhaps someone for whom you have feelings of awe. What is the primary quality or attribute you most admire in this person? Maybe their courage, their conviction, their charisma, their intelligence, their creativity, their talent. What’s the quality you admire most? Now, think of someone you despise. Despise too strong of a word? Then think about someone who often rubs you the wrong way. What don’t you like about them? Maybe their selfishness, their cluelessness, their nastiness, their inauthenticity. One of the most fascinating discoveries in psychology over the past century is a mental mechanism called projection. These positive qualities conflict with our conscious identity. Owning these qualities is an awesome responsibility. We have a fixed mindset. Essentially, it goes like this: starting in early childhood, we begin psychically cutting off parts of ourselves. We separate from our best parts of ourselves like courage, generosity, and compassion. And we disidentify with our worst parts like envy, pettiness, and rage. We cut off from anything that we can’t find a way to integrate. In so doing, we divorce ourselves from anything that doesn’t get acceptance or approval from our environment including our parents, teachers, family, and friends. We strive to become, in a sense, “normal,” average. Desperately wanting to fit in during childhood and adolescence, we seek the middle. Not our middle, but the middle of our social groups and society itself. But we can’t really cut off parts of ourselves. I mean, where are they going to go, really? In the animated film Inside Out, the creatives at Pixar illustrated these disowned parts and lost memories as ball dumped into a dark abyss. 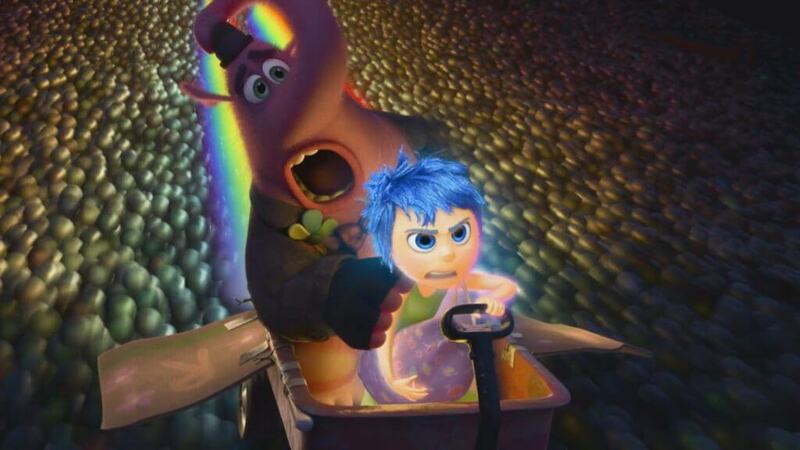 An aspect of the personality, in this case, Joy, must go on a dangerous adventure to access these lost parts. All of these qualities get packed away into what psychoanalysts call the shadow. Or what poet Robert Bly called an invisible bag we drag behind us since childhood. And so, because we can’t easily identify these qualities within us, our minds project them out onto others. When you get irritated at your colleague’s selfishness at work, you are observing his selfishness. But your irritation is a result of not owning your own selfishness. Instead, you have an understanding that stems from self-awareness. There would be no emotional trigger to cause irritation. The converse is also true. We project our greatest potentials and possibilities on other people. This person then becomes larger than life to us. Our culture is ripe with this kind of psychological projection. We call it “hero worship” and it happens in every field, relationship, family, school, and office. Let’s say you’re an aspiring public speaker. You follow the work of your favorite speaker carefully. Sometimes you idolize him, hanging on his every word. You admire his effortless calm and confidence on stage. Here too, you are projecting. You have disowned your confident part and have identified with a more anxious, fearful part of yourself. If not, you wouldn’t be in awe of him. Instead, you would notice this speaker’s own insecurity behind his confident facade. That is, you would see him not a hero, but as a fellow human being. The difference between this speaker and you is mainly that he’s putting forth greater effort to be on that stage. He may be honest with his own insecurity or he may be deceiving himself. Either way, his insecurity is there. And if you don’t see it, it’s only because you are projecting. And we are all projecting onto others most of the time. Many people do this with celebrities. To them, people like Brad Pitt and Angelina Jolie are like royalty. Others project onto musical artists or star athletes. Business people often do this with titans of industry like Richard Branson, Bill Gates, or Elon Musk. They fail to see their humanity; these figures become superhuman to those who project onto them. Self-improvement enthusiasts might project onto figures like Tony Robbins or Tim Ferris. They may see them as productivity machines, fearless, efficient, masterful. Spiritual seekers project their best selves onto people like Eckhart Tolle or the Dalai Lama. In every field, there are numerous characters that legions of people project their best selves onto. But we don’t just project our best qualities onto celebrity figures. We also project onto our spouse, our friends, our professional colleagues, and even our neighbors. The problem isn’t that we project onto others. This is a normal and healthy process in our own development. The challenge comes when we don’t recollect our projections and reintegrate our latent potentials. Sometimes these projections break, especially when scandals enter the public’s eye. How many people were shocked at Tiger Woods’ infidelity? How could a fine, upstanding athlete consistently cheat on his wife? Only by way of psychological projection can such a question arise. I projected my inner gold onto various “self-help gurus” in my 20s and onto a spiritual teacher in my 30s. Each time, I raised these figures high above me. Their character, capabilities, attributes, and achievements were so far beyond what was possible for me that I could only be in awe of them. Having access to information behind their public persona eventually helped break these projections. In each case, I slowly learned more about the real person behind their social mask. Each time, I was shocked, then confused, then rageful. I didn’t understand what was happening. The disillusionment was difficult. I felt betrayed, tricked. But that’s because I didn’t understand how psychological projection works. Now I know that my disillusionment was because I unconsciously projected my own latent potential onto them. For example, maybe you have a latent natural confidence, or a keen mind, or a big, caring heart. These qualities might conflict with your current behavior (which was conditioned by your early environment—parents, teachers, kids at school) and how you see yourself. Psychologists call this cognitive dissonance. The mind doesn’t like this ambiguity and confusion. In this case, your mind really doesn’t know what to do with these positive qualities or how to relate to them. And so, when we don’t know how to bring these positive qualities back into us, our mind is left with only one option: project it out onto another. Psychologists consider projection to be a “defense mechanism.” We do it to keep us safe and in the known. Reclaiming our projections—good and bad—is unknown and therefore, feels unsafe. We often shy away from this responsibility because it means being totally accountable. 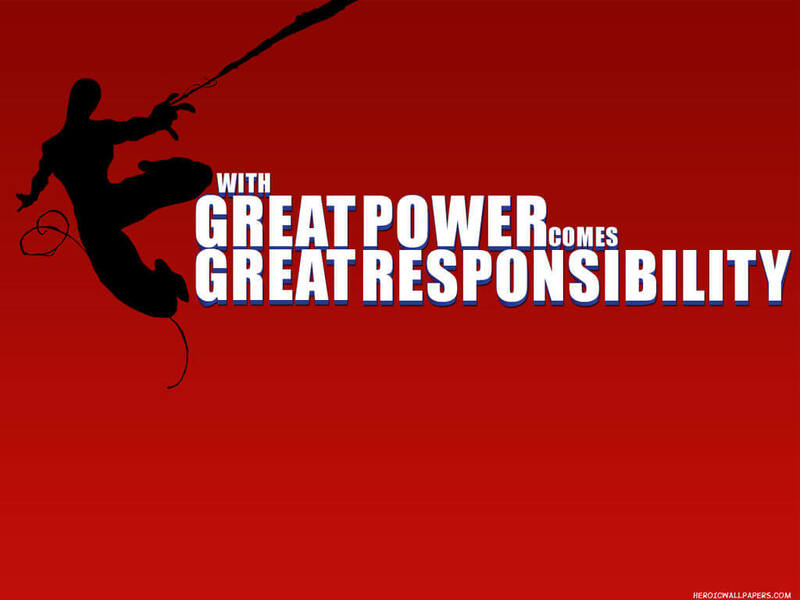 What if we hold these awesome powers? What if we fail to actualize these latent potentials? But more importantly, it means we have no one to blame but ourselves. It means no one from our past or present is the determinant of our future character and behavior. This, if you look at it deeply, can be terrifying to the part of us that resists growth and development. Psychologist Carol Dweck’s research on success has revealed that we hold either a fixed or growth mindset (or mixed). With a fixed mindset, we believe our intelligence and abilities are static. This leads to a desire to look smart and a tendency to feel threatened by the success of others. In contrast, with a growth mindset, we understand that intelligence and abilities can be developed. This leads to a desire to learn and a tendency to find lessons and inspiration in the success of others. With a growth mindset, you are destined to actualize more and more of your latent potential, giving you a greater sense of free will. With a fixed mindset, you tend to plateau early in life and abort your self-actualization. That is, with a fixed mindset, you will always project your potential onto others and never put forth the effort to actualize it in yourself. With a fixed mindset, you envy the success in others. With a growth mindset, the success in others teaches and inspires you to realize more of your own potential. Only with a growth mindset can you reclaim the best stuff in you. Most of our potential is hidden from us. We aren’t conscious of what we are truly capable of—our innate strengths, drive, discipline, latent talents, courage, and creativity. Inner gold is the highest value in the human psyche. It is our soul, the Self, the innermost part of our being. It is us at our best, our twenty-four-karat gift to ourselves. Everyone has inner gold. It isn’t created, but it does have to be discovered. Inner gold is another term we can use for our positive shadow. To integrate the positive Shadow is to acknowledge our own untapped potential behind the awe we have of others. We begin to acknowledge and to release from within ourselves the very talents and qualities we admired in others. Psychological projection is a natural process in childhood. In an ideal environment, I believe we would all reclaim our projections in early adulthood. We would naturally grow into strong, highly-capable, mature adults with innate abilities beyond our imagination. But the reality is different and most of us project our inner gold onto others throughout our lives. Generally, we don’t exchange gold well, and much of our depression and loneliness revolves around misunderstanding this exchange. We run around in a state of guilt. I’m a failure. This isn’t working. What are they going to think of me? But when you understand the transmission of gold, you can honor it and not feel guilty. You know something indirect is taking place. You can sense it, but you can’t possess it yet. Just try to remember that it’s your gold that is being held by whomever or whatever. Knowing this gives you a certain dignity, which we all desperately need. As long as our inner gold is being tossed about, we can not embody our true creative gifts. The pervasiveness of this problem is difficult to appreciate. “We barely understand how much of what we perceive in others and the outside world are actually parts of ourselves,” Johnson writes. Half of the battle of reclaiming your inner gold is simply becoming conscious that you’re projecting parts of yourself onto others. Only with awareness can you recollect your psychological projections. And only from your Center in a state of mastery can you cultivate this awareness. Now, here’s a process you can use to reclaim more of your inner gold and make meaningful changes to your personality. The following process was inspired by Douglas Labier’s article in Psychology Today, Can You Really Change Your Personality. Step 1: Think of someone you admire or envy. Make a list of qualities or attributes you admire or envy about them. Choose one to work on first. Step 2: Envision what it would look like if you embodied that quality right now in your work, relationships, and emotional attitudes. Step 3: Describe in your personal journal how embodying this quality can change your life. If, for example, you’re working with the quality of persistence you admire in someone, write down how your life will transform when you reclaim this power. Step 4: Brainstorm a list of things you can do each day to strengthen that dimension of yourself as if you are strengthening a new muscle. Through your effort, grace will come. Through this conscious process, you will become more of yourself each day. 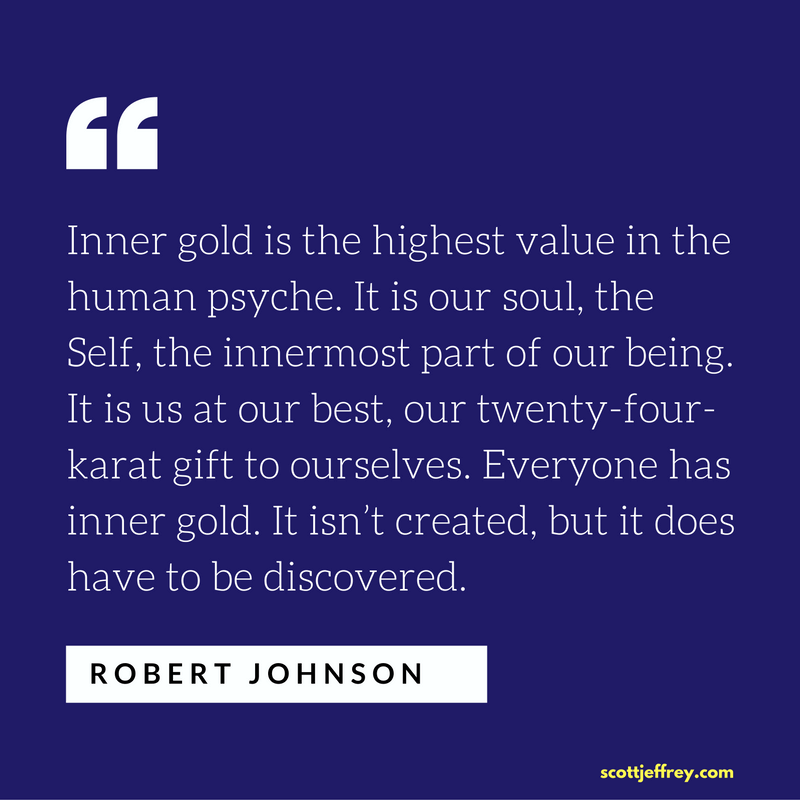 This article was inspired by Robert Johnson’s Inner Gold. I highly recommend it. It’s a fast read; only 76 pages. Johnson has a gift of communicating complex psychological ideas in easy-to-understand prose. Inner Gold is one of my picks for the 10 best books on psychology.